I was one of the first people in Australia to buy the Kindle when it finally reached these far shores. Here's my original review. Things have changed a lot in the last year in the publishing industry with the popularity of ebooks. On a smaller scale, my reading and book buying behavior has also completely changed and so have many other peoples. Watch the video or read the text below. I buy more fiction books for the Kindle. They are about 1/3 of the paperback price here in Australia so while it is prohibitive to read a new fiction book when the price is $35-$40, it is easy to buy one at $11 (although that would still be considered pricey by some). I had pretty much given up reading new fiction because of the price and only really bought non-fiction as new. I used to read fiction from charity shops, the library or ordered it from Amazon.com as a print book if I really wanted it. Now I have 2-3 books a week on the go and I'm loving it! I buy through sampling. Once every few weeks I go onto Amazon.com to the Kindle bookstore and look at books for the last 30 days in various categories. I have a look at a lot of them and send samples to my Kindle of any that are interesting. I may download 20-25 samples at once. Then I read a few pages of them in bed and buy the ones I like as I read. I probably buy 10% of samples I download. I read more books by authors I have never heard of, because of the sampling as above. If a title or cover catches my eye and I download the sample and like it, I will buy no matter who the author. The price does matter. I won't spend over $9.99 on an author I haven't heard of unless the sample is sparkling! I read the same book across devices on the Kindle app. I have the Kindle device by my bed for evening reading. I use the iPhone app to read on the train commute and also in my lunch-hour. I use the iPad to read on the couch in between surfing/reading blogs and also for non-fiction/study purposes. I download samples immediately on recommendation from a website or person. I get most of my book recommendations from Twitter, blogs and podcasts. You may have noticed I spend a lot of time online (!) and so I just tab over and click to download the sample straight away. If it's not available as a sample, I will most likely forget about it. I will generally NOT buy a book if it isn't available on Kindle. I have switched to 90% reading on the devices and prefer not to buy print books as a general rule. I will bend this for books I just have to have that aren't available on Kindle OR/ special edition books, like Carl Jung's oversize Red Book. All these things are good for authors, especially those that are willing to embrace new technologies and get their work out there. These are the take home messages. Publish your work on the Kindle. If you have a back-list, this is even more important. You are leaving money on the shelf if you have books that are not out there electronically. People like me will not give them a chance unless we can download a sample. DIY on DTP.Amazon.com or use a professional like Moriah Jovan or Joshua Tallent at EBookArchitects for format them for you. If you have a publisher, bug them to get your books on the Kindle ASAP. There's no excuse for publishers not to sort this out now. With 70% of the ebook market, Kindle is the place to start. 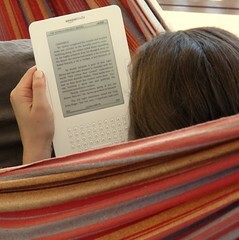 You might also like this article: A comparison between Kindle and the iPad for readers and writers.